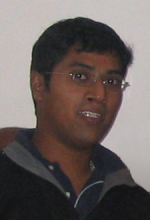 Krishna Sankar M is a Signal Processing Engineer based out of Bangalore, India. His typical activities on a working day involve identifying and modeling digital signal processing algorithms for wireless receivers. Explain and discuss the basic text book concepts in digital signal processing and digital communication using simple Octave scripts. Seeing consistent increase in traffic over the 6-7 months from inception, it was decided to move to an independent platform hosted at www.dsplog.com. (a) Students taking courses in digital signal processing/digital communication and requiring help to understand some of the concepts. (b) Practicing engineers who are fresh to the domain of digital signal processing and requiring help. (c) Ofcourse, the experienced engineers can share tips and tricks associated with the digital signal processing trade. I’ve been following your blog for quite some time and liked a lot. I’ve also started blogging recently about analog design. Please checkout my blog. @3Sigma: Thanks. Had a look at your blog – great ! All the very best! my project on femtocell power control……..
@prasad: Power control should be relatively easy to simulate. How’s the transmitter getting a sense of it’s transmitted power – feedback from the power amplifier and/or feedback from the receiver system? I can learn a lot. I am working on spectrum sensing on TV band. I need to help on how to model a digital TV signal for null and alternate hypothesis. Pls help me with this. @Winston: Are you using power estimate > threshold for the hypothesis? Hello, In this website I have learn much knowledge. Now I am studying LDPC channnel coding. Do you have some source code about block fading channel? I can not know it exactly? I am doing research in MIMO and Transmition Antenna Selection (TAS), may you give me some links or examples matlab codes on this topic? i am a beginer in using matlab. is there a reason between the choosing a MIMO 2×2 with the 64-QAM constellation? are they connected each other? i mean, why don’t we choose 2×3 or 2×4 which have a higher throughtput? the square configuration (MIMO 2×2) and the square constellation of 64-QAM, are they correlated each other? @Dewa: The MIMO configuration (2×2, 3×3 etc) and the constellation (64-QAM, QPSK, 16QAM etc) are independent design choices. For eg, if you see 11n/11ac standard, can see the MIMO configurations with upto 8 antennas, with constellations from BPSK all the way to 256QAM. i want some suggestion from you on my project. i am doing MSK modulation using DDS centered at 60 mhz. please suggest me some demodulation scheme at receiving End. @Mat: If the number of subcarriers are more, then the chances of the frequency offset, phase noise affecting the orthogonality between the subcarriers gets higher. Why have you stopped posting man ?? Currently im doing research on ofdm with qpsk and 64-qam modulation technique. I also need to generate a simulation of it. But im a little bit confuse now…what is the equation for the BER of QPSK and 64-QAM? it will be helpful if you can guide me on how to generate the MATLAB codes. can u provide matlab code for to undersample the pulsed UWB signal?……plz help me sir……. we are trying to implemnt UWB subsampling receiver for 3.1to 10.6 ghz input signal(gaussian pulse).can u help us with matlab code for subsampling receiver..
please sir .kindly help us..
i am stuck with coding in matlab of simulation environment for mobile communication system (mose) for power control in mobile radio system. @hitesh: What is the problem which you are facing? Just found this website. What a wonderful gold-mine! Krishna, very nicely done! Yesterday I sent a mail to your address and also posted a question on forum asking about plotting eye diagram. On one of the thread I found this and had few doubts. Dudes, I salute you for this. One wonderful blog. Do u have MATLAB code for transfering data between two computers using parallel port? @Selvi: 0th subcarrier is not used by controlling the assignment of symbols to subcarriers. In general, modulating the DC subcarrier is not preferred as the DC impairments in RF etc will corrupt the information. in the codeblocks or in Visual Studio, it gives me error. Could you please tell me how to resolve this. @Ajay: I also had the same problem when I tried to compile with gcc. I worked around it by using -lm option when compiling. I have been asked to write a 1/4 soft input viterbi decoder in VHDL or Verilog (I use VHDL as I’m more familiar with it). I have a decent knowledge of Convolutional Codes and Viterbi Decoding and I have access to a 1/2 Viterbi decoder (which I didn’t create). My question is..is a 1/4 decoder much more complicated to design or is there anyway I can use the existing 1/2 decoder? @Bob: Well, its not complex. However, you need to re-construct the trellis based on the current state-next state, input-output transition matrix for rate 1/4 code.